Venton and MarIenne live (since 1980) on their farm east of Ditch Lake. Venton continues to teach school at the Erickson Collegiate and to enjoy the many aspects of farm­ ing. Marlenne has worked for Home Care in Erickson and surrounding area since 1990 and continues to do so. We are feeling the effects of "empty nest syndrome" now that our four children are grown. Our eldest, Shaun, received a degree in Civil Engineering from the University of Manitoba in 1992, and is employed by the KGS Engineering Group in Winnipeg. On April 8, 1995, he married Christine McMillan of Winnipeg, a psychiatric nurse. 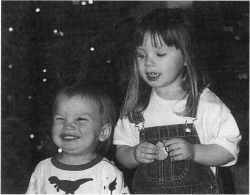 They reside in CharIeswood with their children: Hannah Marie Ethylin, born on September 16, 1996; and Owen Daniel James, born on March 30, 1998. Garett received his degree in Geological Engineering from the U. of M. in 1993. He uses his artistic talents painting, sketching, and sculpting. He is employed by Nickel Electric in Brandon. Our only daughter, Lynell, graduated from Brandon University with a Bachelor of Science degree. She is employed at McDougall Dental Lab and by Child and Family Services. She married Kent Wazura on July 12, 1997 and they reside in Brandon. Kristopher will graduate with his degree III Mechanical Engineering at the U. of M. in 200l. He has worked the past two summers for Highways at their Materials and Research Lab in Brandon. Hans Bekkering is still employed as supervisor III a print shop in Lethbridge. Lilly Bekkering manages a store in Lethbridge. Jason Bekkering graduated in 1992 from Catholic Central High. He traveled and worked for a few years. Then he went back to school and graduated in September 1999 with a power engineer degree. He now lives and is employed in Red Deer, AB. Justin Bekkering graduated in 1995 from Catholic Central High. He played hockey in the Western Hockey League for 4 years. He played for Portland Winterhawks, Saskatoon Blades and the Calgary Hitman. In August 1998, he moved to Europe to play professional hockey. He played for Fife Flyers in Kirkcaldy, Scotland, for one season. In August 1999, he played for Milton Keynes, England. He will be going back to Milton Keynes in August 2000. Candace Bekkering graduated in 1998 from Winston Churchill High. Candace spent one year in Lausanne, Switzerland, working and traveling to different countries in Europe. She returned to Lethbridge in August 1999, spent one semester in school and then left for She field, England to work and to see the rest of Europe. Steven and Dawn Bennett moved to Erickson in 1989, when Steven was offered a seasonal position with Riding Mountain National Park. Later on the position of electrician became permanent. We rented a couple of houses in Erickson until we purchased Christine Johnson's old house in 1991. Married in September 1984, we now have our hands full with two boys: Jayson who is 12 years old and in Grade 6, and Matthew who is 9 and in Grade 2. John Robert Benson was born July 16,1893. He married Lillian Walfreda Gunnarson on December 8, 1920. Lillian was the daughter of Sivert and Olivia Gunnarson. John and Lillian lived on the Benson farm in the Clanwilliam district for the first seven years after they were married. They moved to Lillian's family farm, where her mother lived with them until her death on Febrnary 7, 1945. John's brother George Benson also lived with them until his death on March 27, 1959. John and Lillian sold the farm in 1960 and moved to Minnedosa. John passed away on June 22, 1962. Lillian worked in the dietary department of the Minnedosa District Hospital until her retirement on April 28, 1971. Lillian passed away on June 22, 1985. John and Lillian had four children. Violet was born on August 27, 1922. Florence was born September 19, 1931, and died January 6, 1933. Evangeline was born November 30, 1934. Zedora was born October 27, 1936 and died November 27, 1936.